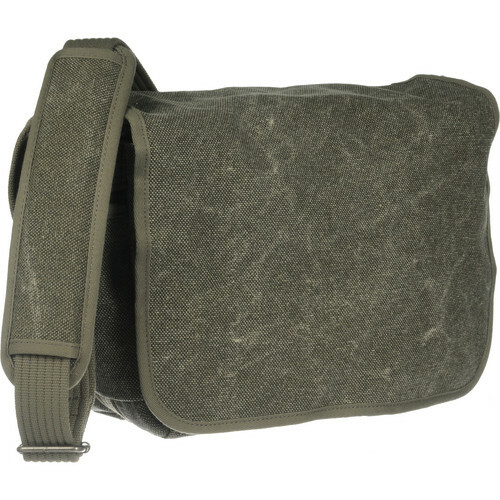 The pinestone Retrospective 7 Shoulder Bag from Think Tank is a shooter's bag. With enough space for your standard DSLR with a 24-70mm f/2.8 attached and a 70-200mm f/2.8 by its side, you'll also have enough room left over for your flash and accessories. Plus, there's a rear pocket large enough for your 10" tablet or 11" MacBook Air. The internal dividers can be configured to accommodate the gear you need that day. Inside, there are two hook and loop nylon pockets that can hold a flash or similar sized item. Outside, under the main flap is another pocket that can hold an additional DSLR body or accessories. For business cards, there's a clear interior pocket for extra cards or your ID. An interior zippered organizer pocket can hold your filters, cleaning cloths and other small accessories. Pens, maps and even more stuff can be kept within a second interior storage pocket. The Retrospective has been designed to keep you fully equipped and unobtrusive while on the job or just out for a walk with the family. It has a classic design that is subtle, functional and backed by Think Tank's lifetime warranty against manufacturer's defects. Box Dimensions (LxWxH) 14.9 x 12.1 x 7.7"
Retrospective 7 Shoulder Bag (Pinestone) is rated 4.8 out of 5 by 141. Rated 4 out of 5 by DRA from The Domke Bag for the Digital Age This bag is classy. I've gone back to shooting all primes and the Retrospective 7 fits all my gear, an ipad Air 2, and then some. I'm a small woman and always have issues finding a bag that accommodates my gear without being too heavy or too bulky which means I own about a million camera bags. My only complaint with this bag is there's not a latch on the front to make it more secure when using the velcro silencers. To remedy that to the best of my ability, I fold the flaps over the velcro about 3/4 down. That way, part of the velcro still sticks and provides security, but I'm not using the whole patch -which is extremely loud. Hence the 4 stars. Rated 5 out of 5 by BuddhaDog from Retrospective 7 Shoulder Bag-by Think Tank What a great bag!!! I have a few bags but been using this one the most! I also have the smaller one-Retrospective 5. Both have lots of pockets, it's a light bag. And most importantly it does not look like a camera bag!!! Big plus for me! Retrospective 7 holds my FUJI X T1 plus two-three lenses. i pad, charger and plus! it's a great bag to travel with , great carry-on bag. The smaller one (5) I use it everyday for when I just want to take only my camera, a book to read, or maybe one lens. Everyday use is great- camera- water bottle- book to read. love this bag!!! Good design THINK TANK! Rated 5 out of 5 by Anonymous from The only bag I need now Like almost everyone, I've got (or had) an embarrassingly large collection of camera bags. This is now the only bag I use. First off, I like the shabby look that doesn't attract attention. It's surprisingly comfortable for a shoulder bag, even loaded with heavy gear. Lots of useful pockets and compartments. My thing is travel, and I've spent years wondering why nobody designed a camera bag that can hold more than just camera gear. What about water, books, maps, wallets, sunscreen, sunglasses, keys, snacks? Plus, at 6'-3, most backpacks are not properly proportioned, and they're hot. This thing does it all for me. Very well made, well designed, well thought out. Rated 4 out of 5 by n8fire from Almost perfect I already own the Retrospective 20 bag and the reason I was interested in this bag is primarily because I could also fit my 11 macbook air along with my camera equipment. The bag is overall narrower than the 20 and slightly shorter but otherwise almost identical with the exception of the padded zippered sleeve at the back of it. It easily fit my Canon 5d Mark III (no grip), 70-200 2.8, 50 1.2 and 24-105 with plenty of room for additional cards, filters, etc. It's a great bag but I wish it was a bit lighter. It does look like it can withstand heavy usage but it's quite heavy at around 3 pounds. Overall like the bag very much. I hope Think tank will release the 20 with a laptop section at some point in the future. Rated 5 out of 5 by Kat from So relieved! I have had my share of camera bags in the past. This Retrospective 7 could very well be my last. That is unless Think Tank themselves revises it and makes it shockingly appealing which I believe would be hard to do. It's hardy but not heavy, functional but not gadgety, spacious but not bulky. I currently carry a pro body camera, speedlite, and two lenses and there's ample room for another lens or speedlite. The shoulder strap distributes the weight so that you forget you're carrying as much as you are, making street photography or the occasional photo walk tremendously easier. I don't like spending a bad penny so I'm so relieved after buying this bag since it meets and exceeds my expectations. Rated 5 out of 5 by Donald from The Goldilocks of Camera Bags Not to big, not to small, perfect size for traveling. Well constructed from durable but soft canvas. Shoulder strap is very comfortable and includes vinyl strips to prevent slippage. Lots of pockets including rear,well cushioned pocket which easily holds my Samsung 10.5 Galaxy Tab S tablet. The Velcro silencers are a great feature as is the separate carrying handle. Below is a picture illustrating the amount of equipment that easily fits in the bag and includes: Nikon D7100 body with Sigma 18-300mm lens attached, Sigma 8-16mm lens, Sigma 35mm f1.4 Art Lens, Nikon SB-800 Speed light, Samsung 10.5 tablet, SDHC card case, Polarizing filters. Overall a well designed, well made camera bag. Rated 5 out of 5 by Mike L from I'd give it 10 Stars if I could I had the Retrospective 30 for my dslr gear but sold it when I went mirror less. I've just ordered the 7 because these are simply, imho, the very best camera bags out there, bar none. All Think Tank products are excellent but the Retrospective line is amazing. These are well thought out bags, hold WAY more than you'd expect, have good features and they look great. And not only that but the material wears like iron. Plus, when you are on the street or traveling they don't scream CAMERA!!! I've tried bags from a number of manufacturers but I've not found any that I like as much as Think Tank. This is the third one I currently own but it is the sixth I've bought. Rated 5 out of 5 by Leonard from The best shoulder bag I ever had I have Fuji gear and recently purchased this bag for my vacation. The reason to buy it was I needed to bring my Fuji 100-400mm lens with me but none of my backpacks could accommodate it. So I was able to place my Fuji X-T2 with 18-135 attached,10-24mm,16mmf/1.4,100-400mm and Fuji X-E2S without lens. Then I placed 2 charges with numerous batteries into one of the outside compartments, remote control, little Fuji flash EF-20, bunch of memory cards, blower, lens cleaners. The bag now looks fat but still keeps it's shape and it's pretty much comfortable to lug it around. If you're in doubt - get it since it's still on sale, you wan't regret it. Will this fit a sony a7iii with a tamron 2875 attached? If the camera is placed with the camera lens attached and facing down toward the bottom of the bag, then yes, the Think Tank Photo Retrospective 7 Shoulder Bag (Pinestone), B&amp;H # THRS7PS, would be able to fit the Sony Alpha a7 III Mirrorless Digital Camera and the Tamron 28-75mm f/2.8 Di III RXD Lens attached to the camera. Again, I have fugifilm XT1 with kit lens, wide angle and telephoto, would the retrospective 7 or 10 - which one being they have similar dimensions? Maybe it's the color, but after being kidded a number of times about carrying a man purse it now sits in the closet unused. I went back to a black leather camera looking bag..
Will this bag fit a Rolleiflex, F100 + 50mm, D700, light meter and about 10 rolls of film? Not sure about your Rolleiflex. I bought it to fit my Canon 7D with a mounted 15 - 85 mm. I am storing a 70 - 200 mm telephoto and a Canon 600EX-RT Speedlite flash and everything fits quite well. There should be enough room to fit the film in the front outside pocket. Hope this helps answer your question. Will this bag fit the Dell XPS13? Answered by: A Ronald G.
I have Fugifilm XT1 with kit lens, wide angle and telephoto lens- would this be the best option for shoulder bad vs. retrospective 5? I believe Retrospective 5 will be too small to fit the XT1 with all three lenses. Retrospective 7 should be able to better accommodate your gear. Is there a secure location within the Retro 7 for SD Cards and extra camera batteries? Am concerned that if placed in the front unzipped pocket, they could fall out and get lost. On both sides of the inside there are pockets with velcro closures. These are good should there be a case that holds multiple SD cards. On the front pocket I keep a filter, shutter release, and 500d lens. The inside pocket postit notes pencil A pocket that holds a battery or filters The zipper closures are only on the back inside and outside. would a 6d with battery grip fit here? i only have 2 lenses, a 24-70 and 70-200. The only way I can see all that gear fit is if you place the body and lenses separated. I use this bag with my 5d mkiv, 50mm L mounted to the body, and my 24mm L. That's all the bag can fit in the main pocket with that set up. Will this bag hold a Canon 40D dslr with a battery grip attached? I can't answer your question directly, as I returned the Retrospective 7 and bought the 10 so I could carry my Canon 5D Mark III with the battery grip attached. It's a great bag, by the way.